What is the ‘One Tree, One Family, One Humanity’ Project? 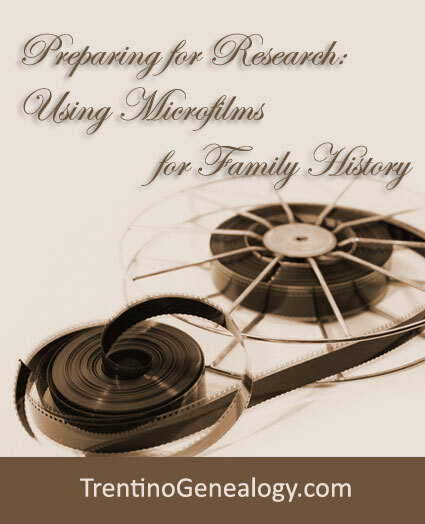 Lynn Serafinn tells how the genealogy research project ‘One Tree. One Family. One Humanity.’ aims to create a visual and spiritual reminder of how we are all connected. 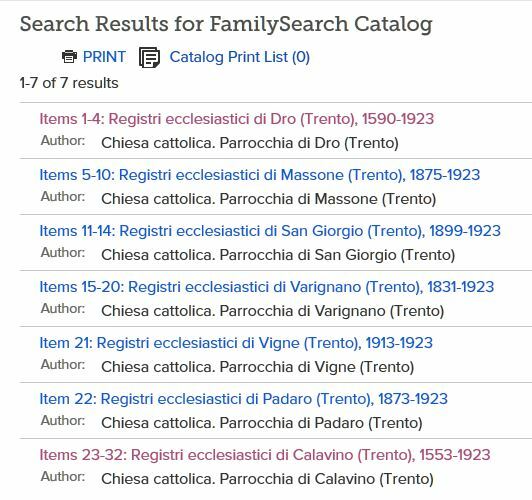 Welcome back to Trentino Genealogy. 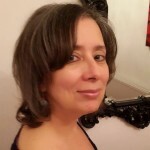 As this blog is brand new, before I start writing articles on genealogy, I thought it would be best to start out by describing WHY I made this blog in the first place. 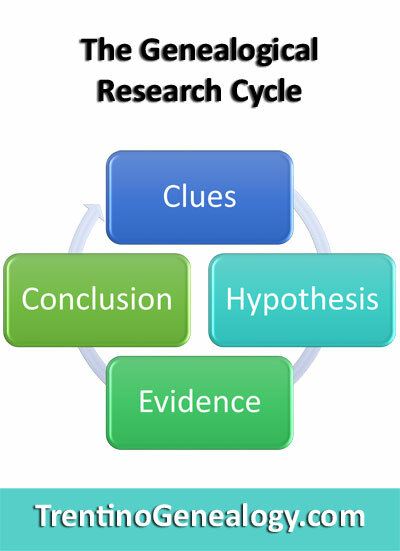 I created this blog to be the home of a research project I am calling ‘One Tree. One Family. One Humanity.’ I have chosen that name because the more I do my research, the more I am convinced that ALL human beings are connected at a fundamental level. I believe the key to understanding our global connection starts by understanding our personal ancestries. That’s why this project will start with the research of a single parish, to serve as a ‘protype’ for other projects to follow. 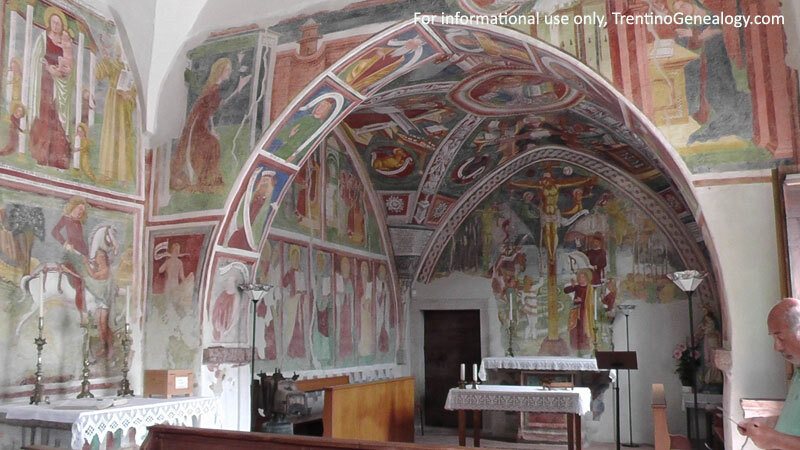 This prototype will be the parish of Santa Croce del Bleggio in Trentino, Italy. Years of research of this parish has convinced me that EVERY person who has even the smallest degree of ancestry from this parish, is related by blood. This is because the vast majority of people in rural Trentino married within their own parish. This creates a rich tapestry of inter-marriage between families. This means, if you look hard and long enough, you can discover a family connection — even if a distant one — with pretty much anyone whose family once lived in Bleggio. And this interconnectedness is not just found in Bleggio, but in any of the ancient and historic parishes throughout the province of Trento. 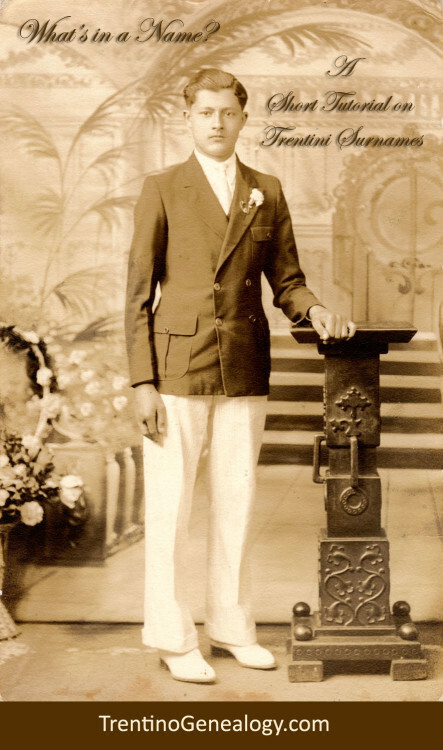 Today, as a result of mass migration at the beginning of the 20th century, thousands of descendants of Bleggio are dispersed throughout the world – especially in the United States. Many of them have little or no idea of their ancestral roots, nor even that they may have many living relatives still in the land of their Trentini ancestors. Conversely, many of the people of Bleggio have become disconnected from their relatives on the other side of the ocean. To reconnect our long-lost mutual family, the goal of the project will be to identify and ‘map’ everyone either born in that parish, or whose ancestors came from there, from the 1500s to the current era, and to create a rich collection of information and resources for living descendants. 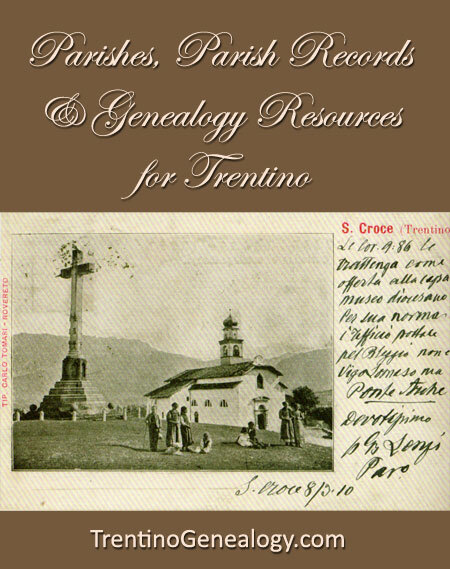 Create research tools to aid those who are interested in tracing their family origins in the Giudicarie Valley of Trentino, Italy (former part of Austro-Hungary, prior to World War 1). Cross-reference all entries so family GROUPS can be collated. Identify as many descendants of these family groups as possible (both in Italy and abroad — especially in the United States, where so many descendants currently reside). Incorporate the vital information, photos, etc. 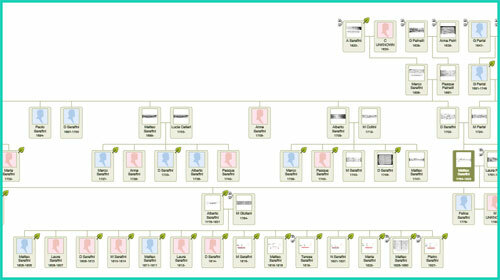 of these descendants into the ‘One Family Tree of Bleggio’. 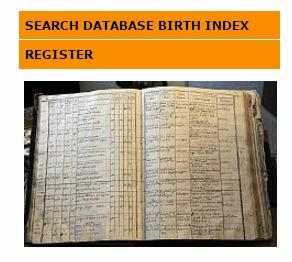 Programme all this data into a searchable, online resource for the public to research their ancestry. Write and publish a series of books on the history of the various family lines of Bleggio, incorporating local history of the times (in both English and Italian). 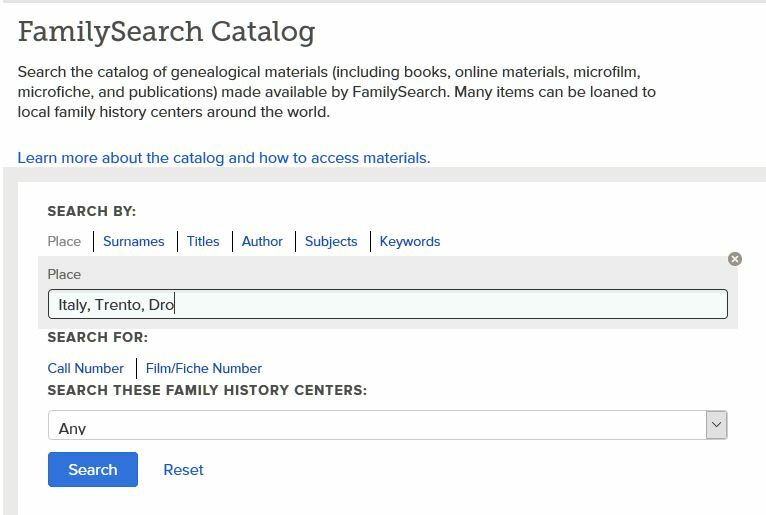 Provide help to descendants of Bleggio in accessing and using these resources, so they can preserve their own family history. Train others to maintain the system and/or to develop the same kind of project for other Trentini parishes…and perhaps in other parts of the world as well. This project is already underway, and many elements of aims 1-5 are partially complete. As of this writing (Feb 2016), over 4,000 names (mostly of Bleggio origin) have already been catalogued, funded solely by myself. I’ve already spent thousands of work hours AND thousands of dollars/pounds/Euros. I haven’t taken a single dime for my work (not yet, anyway). There is no way to complete this project without help from independent funders. For that reason, starting in 2016, there will be a series of fund-raising projects to raise money to complete the various steps of the project. If you would like to see this vision become a reality, I invite you to subscribe to this blog, so you can receive our articles and be informed when the first round of fundraising will take place. Everyone who supports this project via our fundraising events will receive some sort of genealogical ‘gift’ in return for their support (I will tell you more when we get closer to the time). Thanks so much for taking the time to read about the ‘One Tree. One Family. One Humanity.’ project. 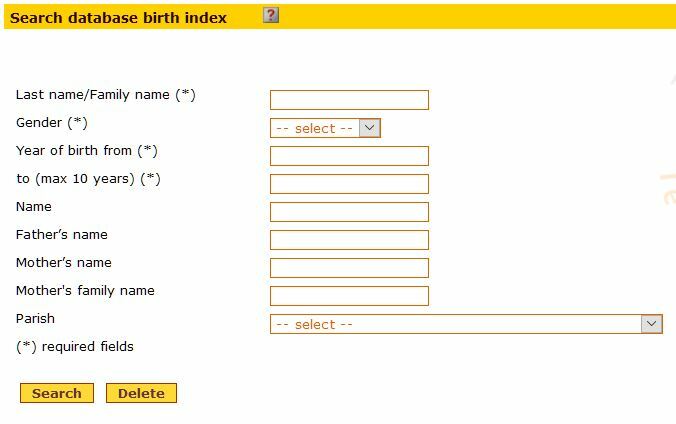 If you’d like to speak to us about the project, please drop us a line via the contact form here on the Trentino Genealogy website. Serafini family in Brooklyn, 1928. 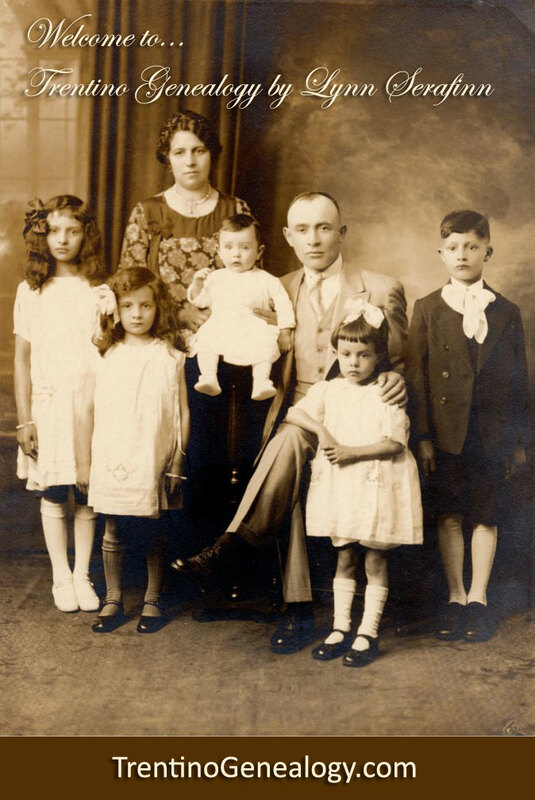 Luigi Serafini, Maria Onorati and their children came to the USA from Santa Croce del Bleggio after World War 1. 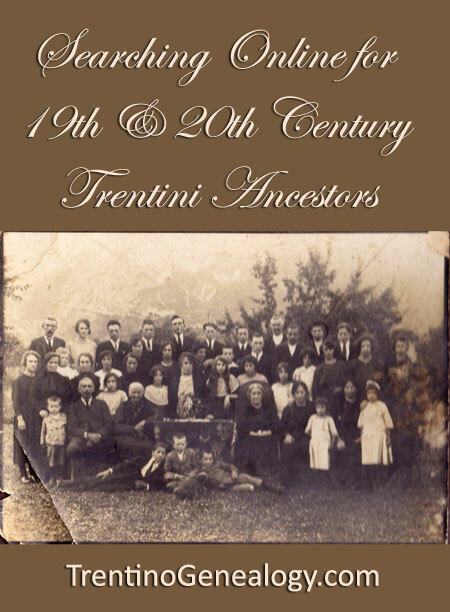 Author & genealogist Lynn Serafinn reveals the ancient roots of the Trentini people, and tells why she prefers the term ‘Trentini’ to ‘Italian’ or ‘Tyrolean’. Welcome. My name is Lynn Serafinn. 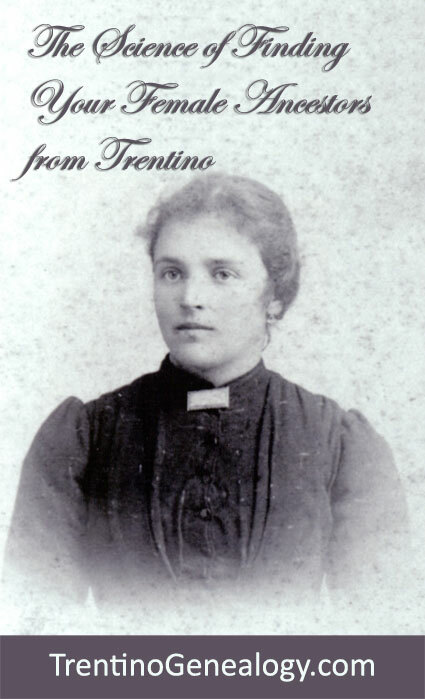 A quick hello to welcome you to my new blog, ‘Trentino Genealogy dot com’. My late father, Romeo Serafini (later known as Ralph Serafinn) is the 9-year-old boy on the right side of the above photo. Romeo was born in the parish of Santa Croce del Bleggio, in the Giudicarie Valley in Trentino, Italy in 1919. 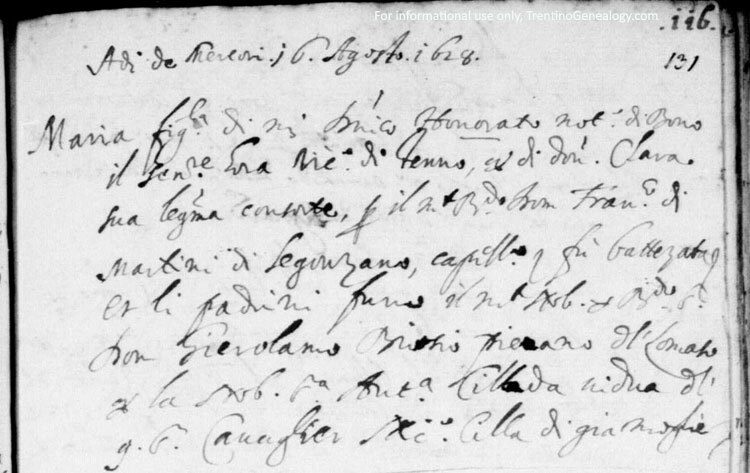 My genealogical research has shown that our ancestors were present in the Giudicarie at least as far back as the early 1500s, when parish records first were used to record births, deaths and marriages. In all likelihood, if older records existed, we’d probably learn that the roots of our family — and many hundreds of others — can claim ancestry in Trentino possibly for millenia. In fact, archaelogists have unearthed many paleo-villages in the region, showing the that an argiculturally-based culture, much the same as our more recent ancestors, was present in this region at least as long as 4,000 years ago. Earlier I referred to Trentino as ‘Italy’ because that is what it is today. However, for many centuries, up until the end of World War 1, Trentino was actually part of the Austrian (and later, Austro-Hungarian) Empire. In fact, many descendants of the Trentini who immigrated to America at the end of the 19th century (or the beginning of the 20th century) don’t think of themselves as Italians, but as ‘Tyroleans’, as Trentino used to belong to the old County of Tyrol. Today, however, it is part of Italy. As this can sometimes create a confusing sense of identify for those who are descended from Trentini immigrants, I prefer to use the term ‘Trentini’ rather than either ‘Italy’ or ‘Tyrolean’ to describe us, as I believe it transcends the political designations, and refers more our ancestors’ connection to the land itself. In my opinion, the unique history and vibrant culture of the Trentini people make them a truly special people. In fact the more I study about ‘our people’, the more I come to love them and respect their values. On this site, I will be sharing information, discoveries, videos, and tips on how to weave together the wonderful history of our Trentini ancestors. I’m just putting together the site, but I have been an avid blogger on other sites for many years, so I promise you some good stuff in the coming months. Until then, please feel free to contact me via the contact form on this website, if you would like to ask a question or discuss the possibility of working together.